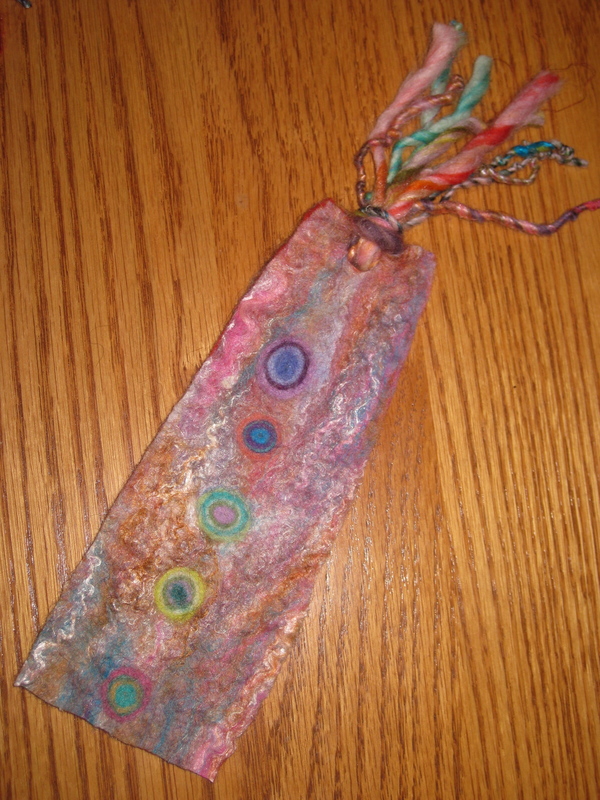 The bottom layer of these felted bookmarks is a merino/yak blend, and the yak fiber yields such a nicely-dimpled texture. For the mid-layer, I varied bright colors of merino so these colors would peek through on the cut edges. The top layer is mostly from merino and silk batts blended on my Louet drum carder — but the batts have other fibers, such as bamboo, and some curly locks mixed in; and I added more silk fiber during layout. 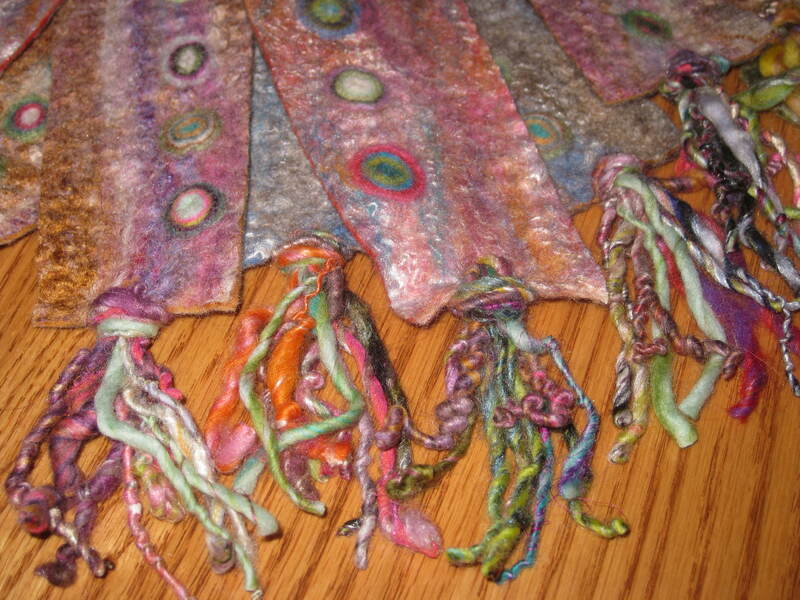 Dots for the surface design, and fringes crafted from yarns I spun on my drop spindle complete these little, whimsical pieces. I’ll package them and deliver about twenty to The Gallery Shop in Lemont; send some out for special orders; and keep some to give as gifts. They take a long time to craft, but every part of the process is relaxing and pleasant. 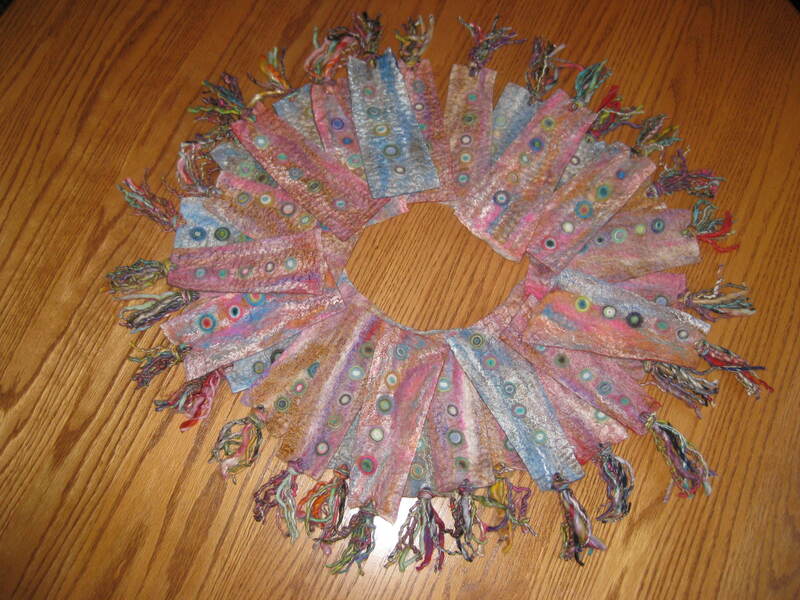 It’s a sweet way to use up those tiny skeins of hand-spun yarns. There’s a bit of snow in our central Pennsylvania forecast for tomorrow; and this will prompt people to think about buying holiday gifts. 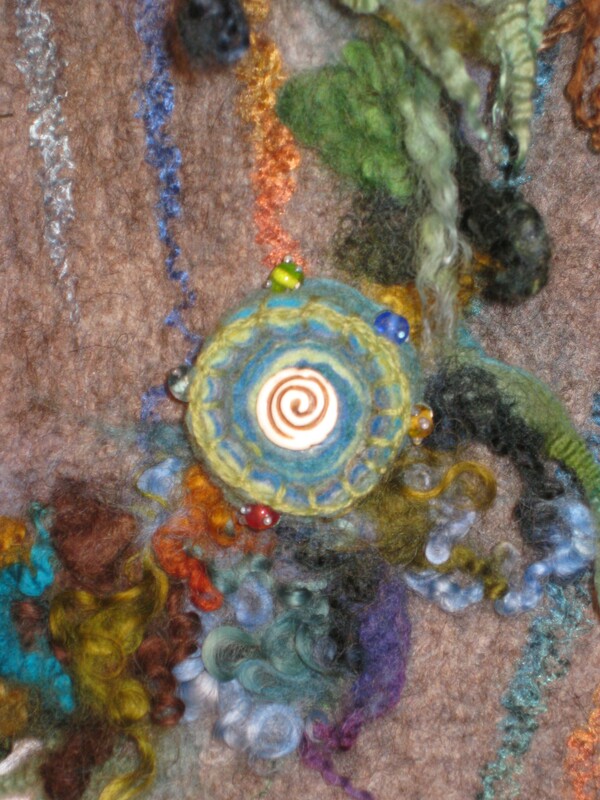 I want to encourage my friends/customers/students/readers to please make a commitment to support your local artists: splurge for a loved one with a gift of an exquisitely-soft knitted scarf that will feel like a hug from you when worn; or a hand-crafted mug that will not cost much more than a few Starbucks lattes, but make every beverage sipped from it taste more delicious; a pair of one-of-a-kind earrings designed and crafted with care; a hand-made journal that will be treasured forever; a pet portrait to remember a special furry companion when they are no longer present; hand-spun yarns to delight the knitters on your list… In my thinking, the only gifts that are more significant than original, hand-made art are gifts of charity to those in need, such as donations to Heifer International; but this is not either/or gift-giving. You’re allowed to do both. If you can make your own gifts, or support local artists, or donate to those in need — please do it!